The San Diego Regional Chamber of Commerce on Monday criticized California’s new $15 per hour minimum wage, saying it will cause some businesses to close. Earlier in the day Gov. 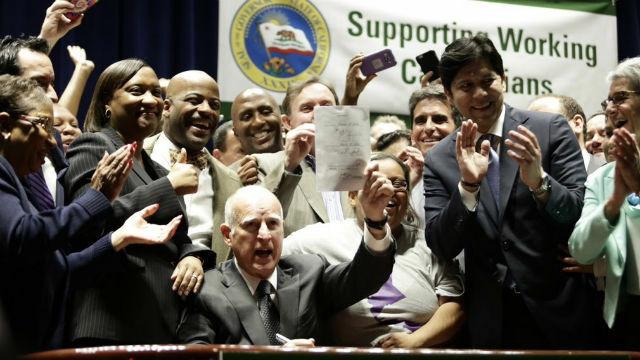 Jerry Brown signed into law the increase, which will boost the minimum wage to $10.50 in January 2017, $11 in January 2018, and then by $1 per year until it is $15 in 2022. “It’s unrealistic to think that this dramatic legislation won’t cause businesses, particularly small businesses, to consider cutting their employees’ hours or letting them go. Some may even have to close their doors,” said Jerry Sanders, president and CEO of the chamber and a former San Diego mayor. Businesses with 25 or fewer employees have an extra year to comply with each step of the increase, but California’s minimum will be considerably higher than in neighboring states. “Regulation such as this makes California a challenging place to do business and is actually counterproductive for many of the families that need real solutions,” he added.